3M™ Ultimate FX Full Facepiece Reusable Respirator FF-400 Series helps provide protection against certain airborne contaminants while keeping your vision clear with the Scotchgard™ protected lens. Scotchgard™ protection makes it possible to wipe paints, stains and other liquids off the large lens. The wide field of view helps enhance what workers can see for better awareness of surroundings. A versatile design allows use with numerous 3M particulate filters, gas/vapor cartridges and supplied air systems. These features combine to make extended wear of the facepiece more acceptable to workers while helping to provide respiratory protection. The 3M™ Cool Flow ™ Valve helps make breathing easier by releasing hot, humid air within the respirator, helping prevent an unpleasant build up of heat. This feature is especially beneficial for hot working environments inside buildings or outdoor projects during hot and humid days of summer. The release of warm air keeps the worker cooler on the job, and it helps reduce the potential of fogging that could obscure vision. The bottom line: A comfortable worker is a more productive and safety-conscious worker. The respirator is equipped with a passive speaking diaphragm to enhance communications, making it possible to talk and be understood without removing the facepiece. This feature is both a convenience and safety benefit. It’s a hassle to keep removing the respirator to simply talk; and if you need respiratory protection in the first place, you don’t want to remove the facepiece in a contaminated area or you’ll compromise the protection it offers. A number of additional features have been built into the facepiece, including a head cradle to reduce pressure points and hair pulling, a soft silicone nose cup and faceseal to cushion heavy contact areas, bonded silicone gaskets to prevent loose gaskets from getting lost, and attachments that easily twist on and off. The facepiece fits securely with six straps that snugly wrap around the head, eliminating shifting that can distract on the job and require frequent readjustment. The straps are extremely durable, having been tested with over one million pulls. 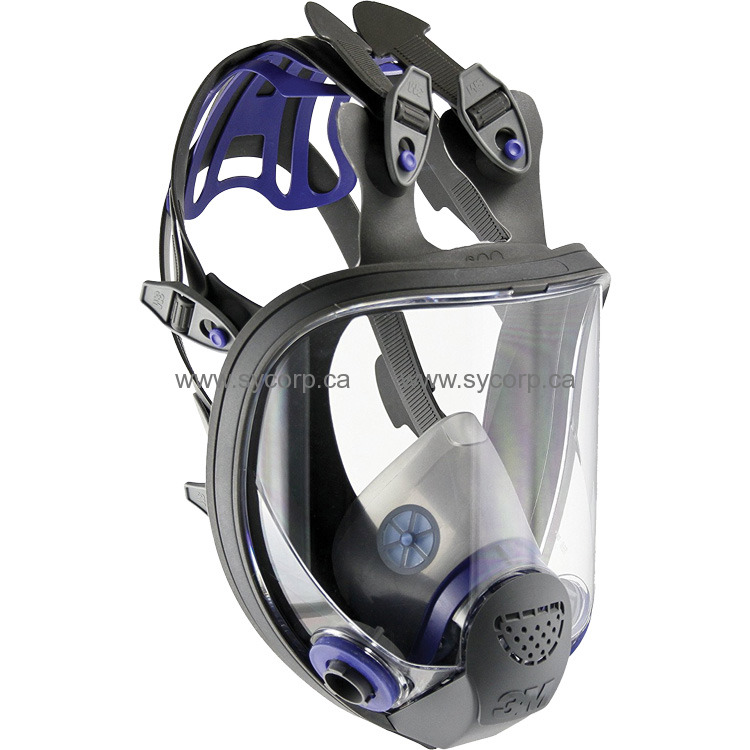 Compatibility with 3M approved filters, cartridges, and supplied air systems makes this facepiece part of a respiratory protection system for a range of jobs and applications. Recommended applications include assembly , chemical clean-up, chemical handling, chemical splash, chipping, chiseling, cleaning, furnace operations, grinding, laboratories, machining, masonry, painting, pouring/casting, sanding, sawing, and welding. Industries in which this facepiece are commonly used include agriculture, construction, general manufacturing, pharmaceuticals, and primary metals.